One thing I've learned as a veteran of the online publishing world and app store rat race is MSM journalists love to tell stories of the runaway successes by beginners. 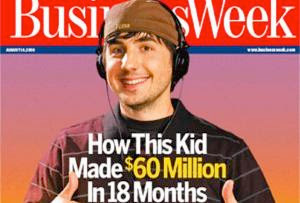 To give you an example, check out the inset BusinessWeek cover from 2006, "How this kid made $60 million in 18 months". The young man on the cover of BusinessWeek is Kevin Rose, founder of Digg. He left his company a few years ago. He may have taken some money along the way, but it sure as heck wasn't $60 million. Digg was sold earlier this month for just $500,000. The result? Enormous hype cycles (anyone remember the scores of multinational companies rushing into Second Life?). Loads of "me-too" products and companies ("it's like Angry Birds ... but with cats!"). Unrealistic expectations ("all we need to do is grab 5% of the market and ..."). And bubbles (BitCoins, anyone?). The same hype cycle has been building for ebooks. It's not just 50 Shades Of Gray, either. There's this Atlantic article trumpeting the fact that a technical review repurposed for ebooks sold 3,000 copies on the first day. I recently published my first ebook, "Dropbox In 30 Minutes." A warning to anyone who expects thousands of downloads on the first day: Unless you are a brand or have the marketing commitment of a major online brand like Ars (the publisher of the technical ebook), you'll be lucky to get a few downloads per day. Yes, it's possible to raise those numbers on your own, but only through lots of hard work (writing quality content, marketing, etc.) and a huge dose of luck. So, mainstream media journalists reading my blog post: Do your readers a favor, and be very careful with anecdotes of success in the digital media world. And my message to potential ebook authors: Don't believe the hype.